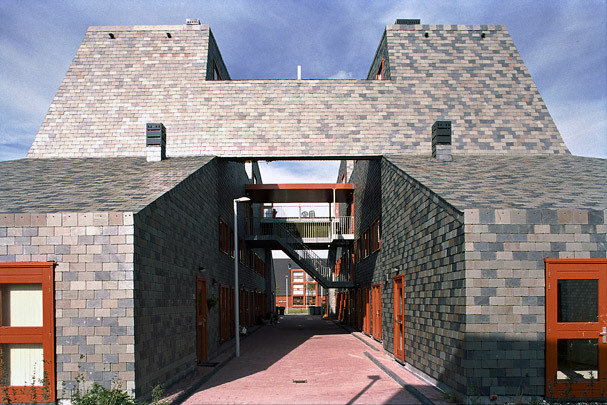 Liesbeth van der Pol’s masterplan locks into the small-scale rural buildings of Vijfhuizen. The architecture of its houses was to incorporate aspects specific to the region. Six sub-areas were entrusted to six young architects whose Archiprix and Europan entries held out the promise of fresh ideas. Marlies Rohmer designed a latter-day take on the traditional ‘stolp’ farmhouse with trendy claddings that include slate and orange frames. There are also larger stolp-like buildings that range rented units around a sheltered street. S333 developed prototypical pitched-roofed ‘farmstead’ units of varying length; their cladding of vertically profiled steel sheet and hardwood is reminiscent of barns. FARO too developed a variant on old Dutch houses with steeply raked roofs. BDG’s dyke and tower units resemble grain silos. The area also includes a number of do-as-you-please plots.